What was your worst experience in the martial arts? The background to this story is some weird illness I experienced in 2004 which resulted in hip inflammation so bad I could hardly walk up stairs with my right leg. At the time we were trying to launch our little martial arts school in Perth - and any demos of kicks were done waist high with my left leg. This affliction nearly ended my martial arts career because I thought it was a back injury that was radiating down my leg, and that the medical professionals just couldn't find the real issue. 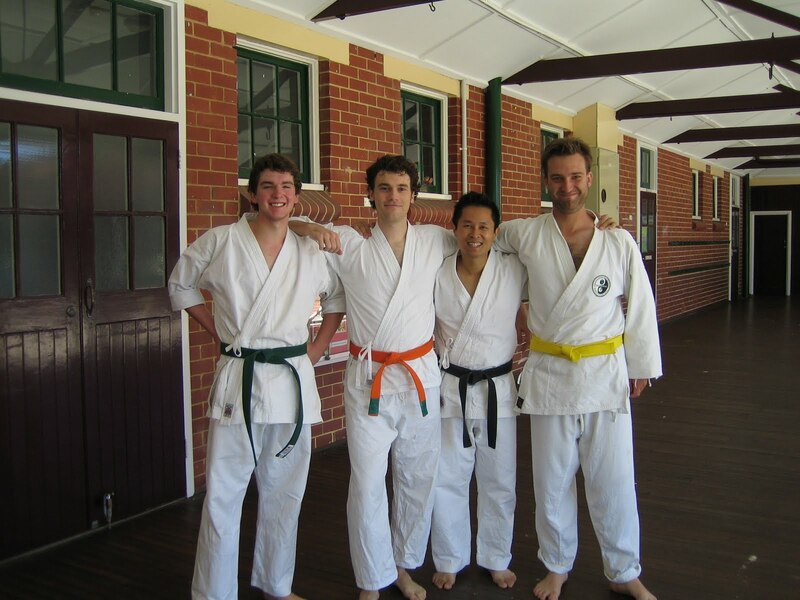 This photo was taken a year or so after the incident when my hip inflammation had been resolved and when I started getting back in shape again.-These are some of my coloured belts in Perth. Look at me - I'm tiny! So easy to pick on! Anyway, it debilitated me for a year - which affected my exercise, training, and of course fear of pushing my body. When a very clever GP finally diagnosed the hip inflammation, the pain was taken away with a few little tablets miraculously. 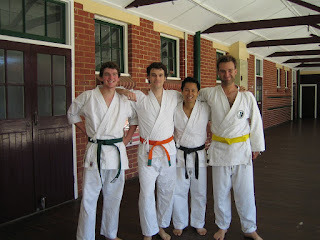 I often travel and meet up with new martial artists. But I'm just going to withhold their names and details because these people still exist and still practice. Anyway, I arrange to meet him at his training center - it's some kind of mixed group that gathers to cross train, before the days of MMA. Only problem - and this should have been my first warning bell - he's a no show. The group is there, but no one knows me. Anyway ... they seem friendly enough to chat. I think there was a guy that was doing some Escrima, and then others who were just gearing up. I get approached to join in their sparring match. The first guy I get paired up with is this huge, very fit guy who's wearing Muay Thai shorts and a plain t-shirt. He asks me whether I had any experience, and I said some. That was about it. And then he started a relentless attack which involved thigh kicks, punches and strikes. The thigh kicks didn't bother me - I brought my leg up, turned it out, and caught his lower shin on the top of my shin each and every time. And since this didn't bother him, I assume he'd been viciously conditioning his legs. After not really training for a year or so - to say I was overwhelmed was an understatement. It was full on, and I was under pressure. There were more than a few times when I had to create distance by simply stepping back and turning full around, then coming back again. Anyway, you get my drift. Then it happened suddenly. I was in a standing clinch with him. My head was down, and I fired an-over-the-shoulder strike ... and you know when something sickening happens, it happens in slomo ... I felt it hit him full in the neck. And I felt it slowly from the pit of my stomach to the edge of my thin cotton padded mitts. The strike landed on something squidgy and there was movement from the larynx. He just stopped short. Just froze in shock and pain - knowing full well what just happened, I immediately held on to him while we stood there. You could see his eyes starting to bug out of his skull, and he held on to his neck with both hands. Fortunately, the strike entered from the side - and missed hitting him square on in the throat. To cut a long story short, after several moments of him trying to panic-swallow then breathe, that session stopped, and I went to fight another two people who were a little more controlled. One of them also told me the first guy was a knockout artist and always went for the kill. The next day, my guy who was supposed to have met me at the club called me to apologise for not being there, then told me something like he had to bring his member to the hospital that night to get checked out. Hmm. The takeaway lesson? If you're not in training, go easy. Don't get thrown (or cajoled) into the deep end unless you have someone there to coach you through it or to ref you out of it. Also is the need to stress and reiterate self-control. Self-control for any technique in a safe match means you identify the target before you strike out. No blind techniques allowed. Especially given that the ground was concrete - not matted. And lastly, if anyone is injured they should not walk out of that training hall by themselves - they should be accompanied until they can be checked by a medical professional. This could have ended very badly folks. Be careful of how you train! And be careful of who you train with!